GRAFENWOEHR, Germany — A 2nd Cavalry Regiment Soldier received the 2018 U.S. Army Garrison Bavaria Environmental Officer of the Year award at the Community Leadership Information Forum, Feb. 12, here. Sgt. Jordan Quiernan with 3rd Squadron, 2nd Cavalry Regiment, was recognized for taking the initiative to improve the unit’s environmental program by setting a high standard for storage and handling of hazardous materials and waste in compliance with U.S. environmental regulations and host nation environmental laws. 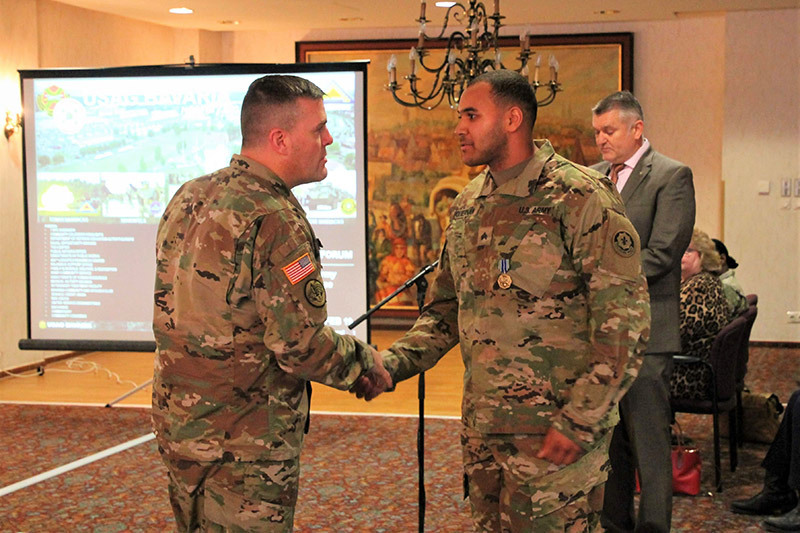 USAG Bavaria Garrison Commander Col. Adam J. Boyd awarded Quiernan with an Army Achievement Medal. Duties of a unit environmental officer include weekly inspections of hazardous materials and waste, as well as daily activities around the motor pool and during field exercises, such as inventories and proper environmental checks. “Every time I walk through the motor pool, I constantly look around for the inspection checklist items to make sure everything is in compliance,” said Quiernan. Iven Schroeer, USAG Bavaria Environmental Division compliance inspector, is impressed with Quiernan’s efforts and achievements during his time as an environmental officer. “It is important to build a relationship with their colleagues to make sure others are interested in and excited about what they have to say,” said Schroeer, who noted this was prevalent in Quiernan’s unit. Quiernan also worked to ensure his unit maintained high participation in their Hazardous Materials Compliance course, an informational class that educates Soldiers on how to increase compliance in their unit. Quiernan was honored to receive the award and emphasized that the success of the 3rd Squadron’s environmental program was a group effort. “I want to thank the Soldiers and the unit for helping me keep the motor pool and working locations clean of hazardous waste,” said Quiernan. He added that learning from the former environmental officer, Staff Sgt. Beau Murray, who won the Environmental Officer of the Year award for fiscal year 2017, was a great help. “He guided me in knowing what to do to be in compliance through rigorous checks during inspections and on a daily basis,” said Quiernan. 1st Lt. Wooli Lee and Spc. David Kennedy are the alternate environmental officers for 3rd Squadron, 2nd Cavalry Regiment. They also assist with implementation of environmental regulations and practices. Their contributions to the high quality standards at 3rd Squadron are appreciated by the unit and the USAG Bavaria community. Learn more about USAG Bavaria’s Environmental Division at home.army.mil/bavaria/.